Generous Wilds, no-nonsense free spins bonuses, and a classic theme that never fails to draw in the online slots crowd: slot developer RTG’s Rome-inspired slot, Caesar’s Empire, hits the spot on most levels. 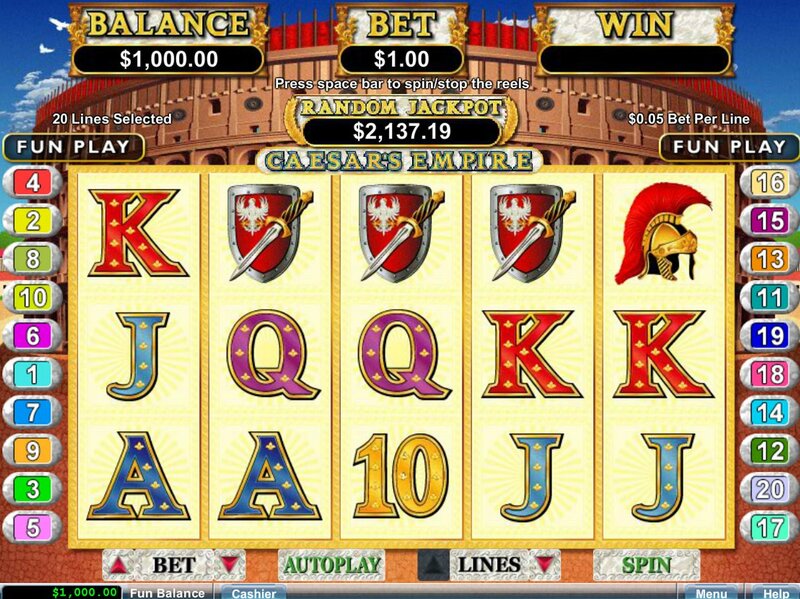 A 5 reel, 20 payline slot, Caesar’s Empire from Real-Time Gaming has the developer’s customary solid gameplay (if, sadly, its propensity for bog-standard graphics) and plenty of appropriate symbols: gold coins, the Coliseum, Cleopatra, a gladiator helmet, swords and shields, and the standard 9-through-Ace icons. All the ingredients are here for what you would assume would be a classic Roman-themed slot that would prove popular with slots players. The big question... is that really the case though? The gold Caesar dinari is the game’s Wild, substituting for all regular symbols in the game other than the Scatter. It only appears on the first four reels, but it will triple your wins when it forms a winning combo. The Scatter in Caesar’s Empire is the Coliseum icon. A free spins bonus round will trigger when you hit a Caesar Wild on the reels at the same time as a Coliseum Scatter on the fifth reel. 10 spins are yours and there’s a 2x multiplier attached to wins during the free spins round. During the bonus round, all Scatters that appear will change to either Wilds or Cleopatra symbols. Plus, for every Wild that appears during the bonus round, you will be awarded a further 5 free spins. While we’re on the subject of nice bonuses, there’s a progressive jackpot in the game – awarded randomly – which you can follow via the ticker at the top of the base game screen. Caesar’s Empire is an interesting game from RTG. 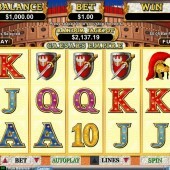 Roman-themed slots are popular, but including the Roman-era character of Cleopatra – the queen of Egypt – is a smart move. IGT’s Cleopatra slot is hugely popular, both in land-based casinos and at online casinos, so putting her in this game is a good move. Enjoy the themes, ignore the basic graphics and gameplay, and try and bag yourself a juicy progressive jackpot win. You’ll be empire building in no time!